Also serving communities of Poquoson. There are 29 Assisted Living Facilities in the Hampton area, with 9 in Hampton and 20 nearby. The average cost of assisted living in Hampton is $2,544 per month. This is lower than the national median of $3,346. To help you with your search, browse the 133 reviews below for assisted living facilities in Hampton. On average, consumers rate assisted living in Hampton 4.1 out of 5 stars. Better rated regions include Suffolk with an average rating of 4.5 out of 5 stars. Caring.com has helped 8 families in Hampton find high-quality senior care. To speak with one of our Family Advisors about assisted living options and costs in Hampton, call (855) 863-8283. Hampton is an independent city in the Commonwealth of Virginia and home to scenic attractions such as the Elizabeth River, Sandy Bottom Nature Park and Casemate Museum of Fort Monroe. It's also home to a growing 55 and older community that makes up 27 percent of the population. As such, the town has nine local and 49 nearby assisted living facilities (ALFs) for seniors to choose from. Each community is licensed as either a residential living care facility, aiding minimally with activities of daily living (ADLs) or as an assisted living care community, assisting more so with ADLs, medication management and recreational activities. 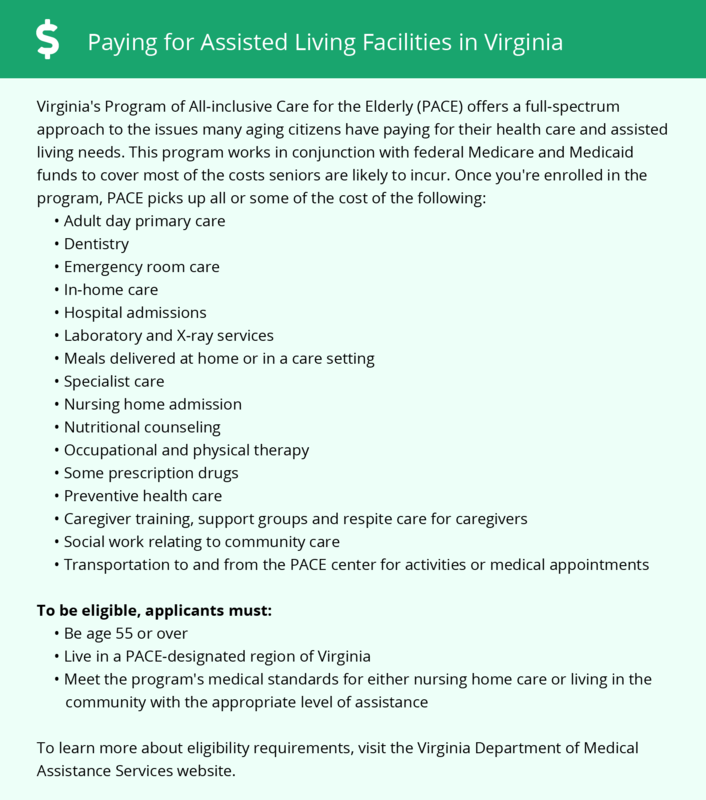 The Virginia Department of Behavioral Health and Developmental Services (DBHDS) licenses and regulates these facilities to ensure the health and safety of seniors. When compared to the national average of 100, Hampton residents pay a cost of living that is cheaper by 6 points, ranking in at 94. It is also less expensive than the 107-point state median. Seniors here can expect to save on groceries and transportation while paying more on health care. Safety may be a concern to seniors living in Hampton as the town has a crime rate that is 95 percent higher than all other neighborhoods in Virginia. Seniors with respiratory illnesses or severe allergies experience better breathing conditions in the town where air quality is better by 21 percent and pollution levels by 20 percent when compared to the national medians. Summers in the Hampton area is usually mild with temperatures rarely exceeding the high 80s in the hottest months of July and August. This is followed by warm winters that average between 33 to 56 degrees with few snowstorms. Hampton offers locals several forms of transportation, including the Hampton Visitor Scuttle Bus, Hampton Roads Transit Bus, Amtrak train, The Tide Light Rail, Paratransit, Elizabeth River Ferry, VB Wave Trolley and Bayfront Shuttle and Peninsula Commuter Service. Each of these services offers a discount for senior fares to make it more accessible and budget-friendly. Hampton has an array of community resources for seniors, including the Hampton TRIAD, an organization that works together to help reduce crimes and victimizations against seniors and performs daily checkups. Assisted Living costs in Hampton start around $2,544 per month on average, while the nationwide average cost of assisted living is $4,000 per month, according to the latest figures from Genworth’s Cost of Care Survey. It’s important to note that assisted living rates in Hampton and the surrounding suburbs can vary widely based on factors such as location, the level of care needed, apartment size and the types of amenities offered at each community. Hampton offers state supplement to approved seniors through its Auxiliary Grant Program and Supplemental Security Income (SSI). Medicaid also provides aid through the 1915 (c) Home and Community-Based Services (HCBS) waiver. Hampton and the surrounding area are home to numerous government agencies and non-profit organizations offering help for seniors searching for or currently residing in an assisted living community. These organizations can also provide assistance in a number of other eldercare services such as geriatric care management, elder law advice, estate planning, finding home care and health and wellness programs. To see a list of free assisted living resources in Hampton, please visit our Assisted Living in Virginia page. Hampton-area assisted living communities must adhere to the comprehensive set of state laws and regulations that all assisted living communities in Virginia are required to follow. Visit our Assisted Living in Virginia page for more information about these laws.